On Eri’s first day of middle school, Mirio takes off from his part-time to walk with her. Squished on the swaying train, she watches students huddle around their phones and businessmen with papers crowd the seats. Eri’s new shoes pinch her toes and she grips Mirio’s large and warm hand with all her terrified strength. They pass by newstands with magazines on the up-and-coming rookie Pro Heroes. Large swaths of Deku green paint the covers. She hasn’t seen Midoriya since his graduation two months ago. Or Eri watches Midoriya's first steps into the pro hero world and takes a few leaps of her own. This fic was the collaboration between Sou and I. She drew three gorgeous comic pages for this story that I'll link at the bottom. Written for the big damn heroes fanzine. “If you need me for anything, you just need to call me and I will bust through those doors and kidnap you.” Mirio tells her and Eri tries to muster up a weak smile. The other kids run past her, chattering with their friends. He stands by the gates until Eri turns the corner into the school and can no longer see him in the distance. After Chisaki, after Midoriya, Eri’s whole world had been classrooms and schools, tailing Aizawa-san to the teacher’s office or working on her multiplication tables in the back of classrooms. Yet in these unfamiliar halls, her homeroom feels claustrophobic, nothing like UA. Even the doors are smaller. When she accidentally slams it too hard, everyone stops talking and stares. Eri’s shaking fingers take the chalk from Nanami-san’s manicured hands. Sucking in her breath, she mutters, Keep it together, keep it together. Her quirk stays where it is, in the vice grip of her sweaty concentration. The chalk does not crumble to dust in her fingers. Nanami-san does not lose her wrinkles. If her kanji strokes come out wobbly, at least no one says anything. Then the teacher asks her what she wants to be in the future and Eri freezes, off-kilter. "N-no." She can hear herself mumble. A ripple of mutters around the class makes her heart beat in double-time as Nanami-san looks down at her expectantly. The agonizing silence stretches out as Eri’s mind goes blank. She blurts out, "I-I want to make candy apples." Eri slinks over to sit by a boy with squinty eyes and a horned cap hanging off the back of his chair. He stares at her, unsmiling, as if studying her. Ducking her head in humiliation, she mumbles an apology. She misses UA keenly in that moment, where the doors are the right size, where the students smile at her in the hallways, and where no one, most of all Midoriya, would ever laugh at her. Three months ago, Eri runs out after a fruitless quirk practice session with Aizawa-san. Midoriya follows her out to the bushes behind the empty training fields and he sits with her in the dirt as she struggles to swallow back tears. It’s only a week before his graduation and Eri feels guilty for taking up his time like this. He’s already been talking about the office he's renting in downtown Shinjuku for months now - it's too far for a casual visit. Eri remembers how hard it had been when just Mirio, Tamaki, and Nejire had left UA, scattered into Tokyo for the next chapter of their lives. She can’t imagine how much worse it’ll be when Midoriya and everyone else leaves. “I just- I’m never going to get it.” Eri whispers, downcast, picking at the scars on her arms. Her fingernails dig into the base of her horn. Eri rears up in protest, but at Midoriya’s soft laughter, confusion takes its place. Eri nods weakly. Sometimes she forgets the kindness of the world Midoriya brought her into, too caught up in her memories of the past. As her first day drags on, Eri finds herself dozing off. It is hard to pay attention to Nanami-san’s dull lessons, especially when Aizawa-san already taught her scientific notation and quirk history last year. When study period finally arrives, Eri at least doesn’t have to put on the guise of attention and doodles at the corner of her finished worksheet. “Wait, you’re already done?” The girl with green pigtails in front of her spins around and startles Eri. She squints down at Eri’s worksheet with wide eyes and Eri shrinks back at first, unsure if she’s being teased. “Oh, sorry, Aizawa-chan, I'm Asui Satsuki. I like your doodles. Now, can you help me? I don’t get number five at all." The girl chatters and Eri's eyes widen. The family resemblance is easy to see - bright smile, large dark eyes, and wide cheekbones. Satsuki looks up, surprised, before stretching her tongue to poke Eri’s forehead. "She's my older sister!" "Gross, Satsuki." Kota mutters next to them. When Satsuki sticks her tongue into Kota's ear, he squeals so loud that Nanami-san makes all three of them stand outside and carry buckets of water. At first, Eri’s mortified to be punished, but the relief from leaving the stuffy classroom soon outweighs her shame. She slumps against the wall, arms sore from the bucket’s weight. Next to her, Kota secretly uses his quirk to fill Satsuki's bucket with more water when she's not looking. When, in retaliation, Satsuki slops water onto his prized red sneakers, he starts complaining loudly. "Don't mess them up! They're like Deku's." Kota explains haughtily. "He's the best." "No, Froppy's the best. She rescued a whole cruise ship last week during a storm!" Satsuki laughs dismissively. More water spills onto the floor and Eri bites her lip in concern. Then the two of them turn to her and she freezes. The bucket bangs into her knobby knees as she backs up and Satsuki presses, "Who are you a fan of?" "Um. Both Deku-san and Froppy-san are really nice." Eri thinks back to the graduation dinner when she last saw them. Tsuyu and Uraraka had piled her plate high with one of everything, from crepes to skewers to three types of mochi, telling her she needed to eat to grow. Midoriya had clapped her back when she had choked from eating too fast. Her stomach rumbles. She's hungry and she misses UA. Unable to put the bucket down, she blinks rapidly to clear her vision and mumbles, "...Froppy-san makes good spaghetti. But Deku-san needs the boxed instructions." Kota and Satsuki are taken aback. Then, Kota snorts, grinning for the first time, "Yeah, Deku's curry is pretty mediocre." Shaken out of her reverie, Eri asks tentatively, "You've had it?" Satsuki lets out a croak of laughter. "My sister's spaghetti was always the best. It sucked when she moved out." "She also made tomato and basil pizza for the party." Eri remembers how the cheese had stuck to her fingers. All three of their stomachs gurgle and they give each other bashful looks before they start snickering again. Then Satsuki puts her bucket down and rummages in her pockets. "Hold out your hand, Eri-chan." When Eri obediently does so, Satsuki drops a soda candy into her palm. Gravely, she advises, "Save the wrapper. You can trade them in for a hero card. I’ve been trying to get the holofoil Creati one." "Hey, where's mine?" Kota demands. A wrapped candy bounces off Kota's forehead and Eri catches it before it drops into his bucket. "Here." "...good catch." He looks surprised and Eri beams. The sweetness of the candy is worth the fact that they get punished to mop the floors after school, thanks to all the water they spilled. School becomes bearable with Kota and Satsuki. Her other classmates ignore her after she refuses to show them her quirk, but Satsuki always greets Eri with news about her sister’s latest smuggling bust and Kota brings them hero magazines he snags from the Wild Wild Pussycats’ recycling. Both of them turn disagreement into a pastime, from things as whimsical as Red Riot’s new costume (‘ Too much red.’ ‘How can it be too much red- he’s RED RIOT. ’) to as serious as to Deku’s latest arrest ( ‘He shouldn’t have gone in there.’ ‘Isn’t saving people more important than following a rule some politician made up?’). Despite the fact she rarely picks sides, they eagerly ask for her opinion anyway. Kota nods at her words then, turning pensive and hiding his eyes under the brim of his cap. Eri learns that, for all his bluster and scowls, Kota runs quiet at times. He’s not the only one who goes through bouts of melancholy either. Satsuki doesn’t pry when Eri loses her words, lost in memories. If she knows about the scars on Eri’s forearms or the folded family photo in Kota’s pencil case, she doesn’t say a thing. It’s a different kind of honesty than what Eri’s used to from Satsuki’s sister, but she appreciates it all the same. Each day on her way to school, she sees Midoriya’s face in the news, pulling civilians to safety and smashing villains. Printed on the bright magazine paper, he seems older, a broad-shouldered sentinel that the headlines scream as the ‘Next All Might’. Mirio occasionally buys her the glossy magazines if she stares too long. “The first few years in a pro hero career are always hard. You forget how to pace yourself because you get caught up in the hustle.” Aizawa tells her one evening as she hunches over a magazine, picking through the article with single-minded anxiety. He starts plaiting her hair to keep it out of the way for quirk practice later. “I hope he’s okay.” She mumbles. This week had an exclusive interview with Deku. It’s strange to read his words in print. When Midoriya thanks everyone for their support, she wonders who that was meant for. For Satsuki’s birthday, Eri and Kota buy her tickets to the Tokyo Sea Life Park. Aizawa-san’s busy that weekend with some pro hero business that empties UA of its teachers, so Mirio volunteers to chaperone. When they get off at Kasairikaikoen Station, right outside of the aquarium, the salt heavy smell of Tokyo Bay hits Eri’s nose. Because they arrived early and the security guard is missing from the front gate, Mirio takes her into the pavillion, right to the seaside, to wait for her friends. “Lemillion-san, it’s the ocean!” Eri takes off running and jumps up onto the railing by the sea. Gulls wheel overhead and she lets the seawind tousle her hair. In her excitement, she doesn’t notice the beginnings of smoke rising from the Aqua City shopping mall to the west. “Technically it’s still the Bay, but it all goes out into the ocean over there-” Mirio, grinning, lifts his phone to take a photo. Without warning, an enormous shockwave shakes through the earth, catching them both off-guard. It knocks Eri off the railing and she lands hard on the observation deck. Gulls shriek and scatter in a cacophonous panic. There’s another huge crack and the Hachitama observatory in the distance explodes. Emerging from the wreckage is a monster, two stories tall with a long serpentine neck and multiple grotesque rippling mouths all along its back. It spits noxious plumes of gas, as it streaks across the Odaiba beach, crushing pedestrian walkways under its claws. When it roars, the sound carries across the bay and Mirio claps his hands to Eri’s ears as the nearby windows shatter. Then, speeding out of the wreckage, punching through the thick oily clouds, a tiny figure of green and red charges forward. With a flurry of kicks, he sends the creature flying out into the middle of the bay. The wind from his blows clears away the poisonous gas and the ripple through the crowd makes her heart jump into her throat. Midoriya leaps right after the creature as it starts to float mid-air and bombard the ground with toxic fireballs. Streaking through the air, he tackles it with a crash. The two of them fly out into the sky, high above Tokyo Bay, far away from Odaiba’s beachfront. Even from the distance, Eri can see the creature spawning limb after limb and flailing its neck in an attempt to rip Midoriya in two. “Get down!” Years of training kicks in as Mirio wraps her up in his arms, shielding her small frame. At the same moment, Midoriya surges forward, gripping the creature’s jaws with his own hands. The blast goes off, white-hot and sky-rending. It incinerates the top of the ferris wheel over their heads before Midoriya wrenches with all his might, burned arms be damned, and the beam goes wide into the sky. It sears past the clouds until the creature chokes on its own fumes. Under Midoriya’s grip on its throat, it goes limp, hanging in the air like a broken doll. Eri can feel Mirio’s exhale of relief against her chest as the crowd loses it. Midoriya stands on top of the floating creature, a speck of green, but they can all see the triumph in his stance. On the opposite coast, pro heroes with flying quirks like Ryukyu take to the skies with restraints. Eri loosens her grip on Mirio’s shirt, eager to join in shouting Deku’s name. Then, high above Tokyo Bay, the creature detonates. The white-hot blast scorches outward from the creature, ripping it apart. Pro heroes, civilians, and even the waters of the bay are flung back. Mirio’s arms grip her tight, shielding her from the burning heat, and the light blinds everyone for a second. Then Eri’s vision clears and she sees Midoriya’s tiny figure, suspended, ragged, and limp against the bright blue sky. The scream in Eri’s throat catches. Someone shoves past them down to the rocks and their blood flecks onto Eri’s face. A chill wind rises and a desperate scream tears out from a hoarse throat. The glacier catches Midoriya, cradling his battered body high above the city. 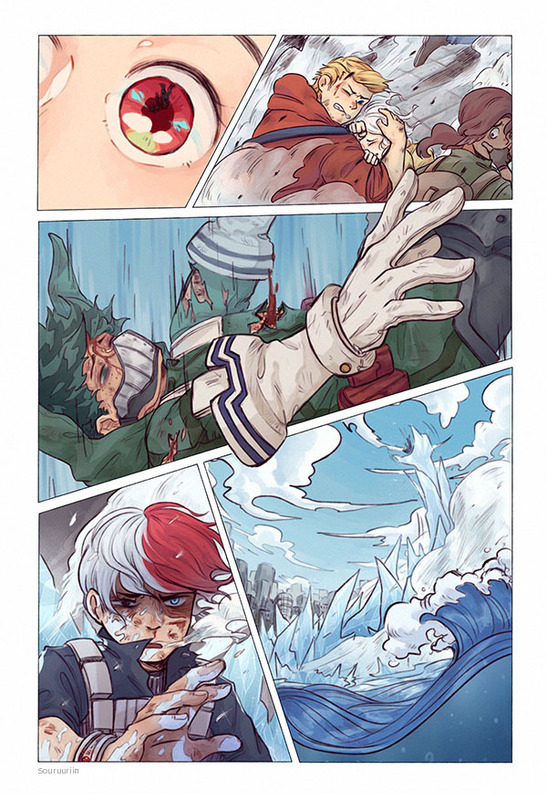 Soaked, wounded, and half frozen under his own ice, Todoroki Shouto drops his shaking hand and sinks to his knees amidst the salt-heavy waves. Before she moved in with Aizawa-san, she had spent weeks inside these sterile walls, terrified that she’d wake up back in Chisaki’s basement. But for Deku’s sake, she runs into the Kasai Shoukai Hospital with a half-formed idea and Mirio in tow. The hospital is in chaos from the aftermath of the fight. No one stops her from slipping past the nurses and trolleys. However, halfway through her frantic run in the hallways, she realizes she’s lost both Mirio and her way. Doubling back doesn’t help and panic begins to gnaw at her. Then she freezes at the sound of familiar voices. Eri recoils at the harshness in Todoroki’s voice. She peeks into the examination room. Tsuyu stands by Todoroki’s bowed form, one comforting hand on his shoulder. “I’m not blaming you. After all, you were scared Midoriya-chan was going to die-"
Neither Todoroki nor Tsuyu can quite look her in the eye and pressure begins to build up under her eyes. “Who's with you? You shouldn’t be wandering the hospital alone.” As Todoroki reaches for his phone, Eri sees the skin of his right hand has a terrifying blue tinge. Her quirk sears out of her in a flash of power as she loses control of herself. Her horn burns as if it was about to burst out of her skull. She can see Todoroki recoil and Tsuyu’s alarmed expression. As quickly as it comes, it fades, leaving the cresting wave of horror in her bones. “I’m sorry, I’m sorry, I’m sorry-” She chokes through her own coughing as her fingers claw at her horn, half-hoping to rip it off. Relief makes her knees buckle and Tsuyu scoops Eri up before she can collapse onto the floor. She hiccups through her tears and Todoroki reaches up with his warmed left thumb to brush them off her cheeks. When the news anchor begins the critical op-ed on Pro Hero Deku's fall, Kota stomps out of the Tsuyu living room with a gruff grunt of ‘bathroom’. Eri wearily mutes the TV. Her body aches too much crying and her horn still itches. Satsuki sets down a half-eaten slice of cake with a sigh. In the kitchen, Mirio had started stress-baking and the cloying smell of cookies fills the house. “Sorry this isn’t much of a party, Satsuki-chan.” Her birthday present, a Froppy themed arts and crafts kit, lays ignored on the couch. “Oh, so now you’re a Deku fan.” Face still pinched, Kota announces his return by flicking water into Satsuki’s face. The squeals of “that’s gross!” and “it’s from my quirk, stupid!” fade into the background as Eri stares blankly at the magazines on the coffee table. One of them has an old interview with Midoriya's grin splashed across the centerfold. She thinks back to when Midoriya had made her candied apples. How he had fought so hard that morning, goading the villain away from civilians, and how small he seemed when he fell. Deku, many have commented how your quirk is like All Might’s. Has it been difficult to live up to that legacy? Even if she tries to summon her quirk, all she feels is a cavernous emptiness inside her, hollowed out by her failure. She doesn’t have any more tears to cry. She sees the newsreels of the crowd amidst the destruction of Odaiba, pointing up into the sky in fear. If I could be even a fraction of the hero All Might was, I would be lucky. To me, it is not the quirk that makes the hero, but the hero that makes the quirk. Remember, quirks are just physical abilities. It’s what All Might said, people’s hearts that matter the most. Eri remembers reaching out for the first time in her life and it was Midoriya’s warm hand that pulled her from the cursed existence she had lived. Something else begins to burn in her stomach. You’re more than just your quirk, Eri-chan. “Have you considered they gave you a wheelchair because you’re supposed to sit in it?” Todoroki’s flat voice echoes through the hospital garden. Midoriya shushes him. With one leg in a brace and bandages across his entire body, he gingerly takes another step under Todoroki’s watchful eye. When his thighs shake, he grimaces and his scarred hands catch the bark of the nearby cherry blossom tree. “I see you’re being as stubborn as usual.” Startled, Midoriya turns to face his former teacher. “Deku-san, we wanted to show you something.” Eri interrupts him, determined. Midoriya falls silent with a look of surprise, before recognizing the seriousness in Eri’s expression. His expression softens. In unison, the three of them flip around to proudly display the ‘No. 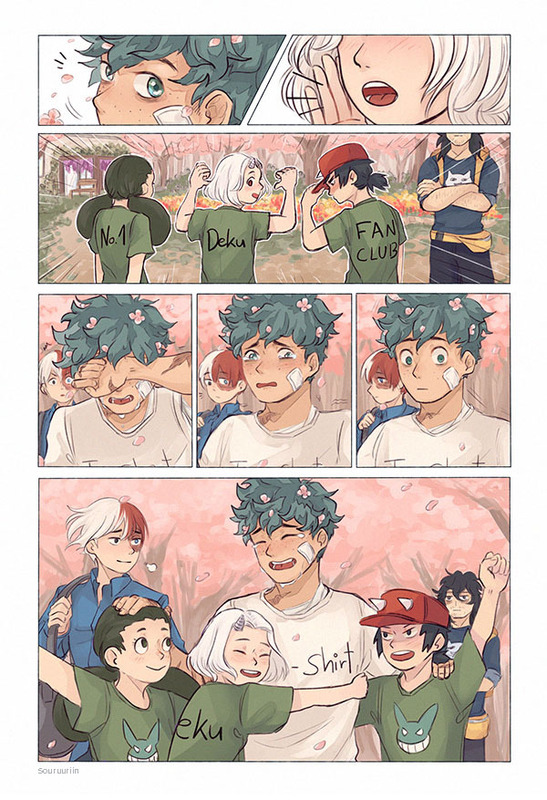 1 Deku Fanclub’ emblazoned on their t-shirts. As Midoriya gasps, Satsuki laughs, Kota blushes, and Eri beams. “Nonsense. They were there, at the Tokyo Sea Life Park. Midoriya, if you hadn’t been there, she would have definitely been caught up in the blast.” Aizawa tells them gruffly and Midoriya stiffens. “We might be the Number One Deku Fanclub, but you already had a lot of fans.” Satsuki grins. Scarred hands shaking, Midoriya accepts the box. Then he sinks to his knees, ignoring his braced leg, and pulls all three of them into a tight embrace. Kota’s cap digs into Eri’s hair and Satsuki’s elbow jams up against her ribs, but, feeling Midoriya’s shuddering breaths against her chest, Eri finds herself sobbing into his shirt. Later, Todoroki shovels Midoriya back into the wheelchair after he nearly topples over standing back up. Eri calls dibs in sitting with him so Satsuki and Kota take turns haphazardly pushing them back inside the hospital. They nearly run over several doctors, to Aizawa’s disapproval, but with one of Midoriya’s arms holding her steady, Eri doesn’t think she’ll fall. “You’ve grown a lot, Eri-chan. I’m glad you have such good friends.” Midoriya tells her, tears and pride thick in his voice. It fills Eri’s heart with light and warmth, and she plucks a stray sakura petal out of his hair. Midoriya’s smile was all the answer she needed. 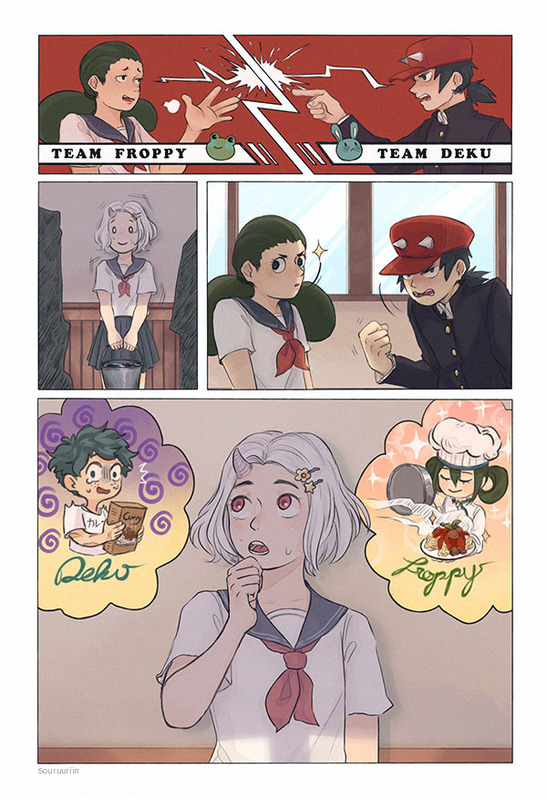 Deku vs. Froppy - Cooking ver. Big thanks to potaters who supported me through the madness that was working on three zines at once. Thank you to the big damn heroes zine for inviting me to such a delightful project. I had wanted to write a story about Eri growing up for a long time, just as much as I had wanted to write Midoriya struggling through his first years of adulthood. You can always find me at argetcross on tumblr. Thank you for reading and please leave a comment if you enjoyed!